Catch Up analyzes the evolution of developing countries in the world economy from a long-term historical perspective, from the onset of the second millennium but with a focus on the second half of the twentieth century and the first decade of the twenty-first century. It is perhaps among the first to address this theme on such a wide canvas that spans both time and space. In doing so, it highlights the dominance of what are now developing countries and it traces their decline and fall from 1820 to 1950. The six decades since 1950 have witnessed an increase in the share of developing countries not only in world population and world income, but also in international trade, international investment, industrial production, and manufactured exports which gathered momentum after 1980. 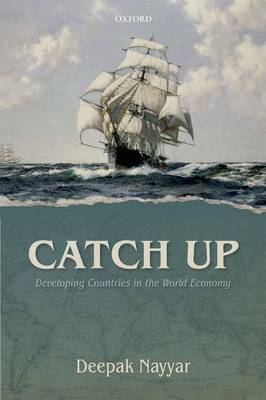 This book explores the factors underlying this fall and rise, to discuss the on-going catch up in the world economy driven by industrialization and economic growth. Their impressive performance, disaggregated analysis shows, is characterized by uneven development. There is an exclusion of countries and people from the process. The catch up is concentrated in a few countries. Growth has often not been transformed into meaningful development that improves the wellbeing of people. Yet, the beginnings of a shift in the balance of power in the world economy are discernible. But developing countries can sustain this rise only if they can transform themselves into inclusive societies where economic growth, human development, and social progress move in tandem. Their past could then be a pointer to their future.